Presenting our fun to drive Clean CarFax 2013 Chevrolet Corvette 1LT Convertible in Torch Red. Powered by a 6.2 Liter V8 that generates 430hp and is tethered to a 6 Speed Manual transmission. This Convertible reaches a top speed of 190mph and a 0-60 time of 4.2 seconds on the test track! Enjoy quick acceleration and exceptional handling while scoring near 26mpg on the open road. As always, Corvette turns heads with its sleek lines, aggressive stance, daytime running lights, and iconic badging. Our 1LT interior is focused on luxury and comfort, for both high-performance driving and day-to-day driving. You'll enjoy conveniences like power adjustable leather seats, keyless entry, and power windows and locks, while the AM/FM/CD radio with auxiliary input lets you play your own tunes on the road. You will even love the feel of the steering wheel with stitched trim that offers awesome hand placement, and OnStar. You will drive this Chevrolet with true confidence thanks to 4-wheel ABS, electronic stability control, traction control, and front and side airbags. 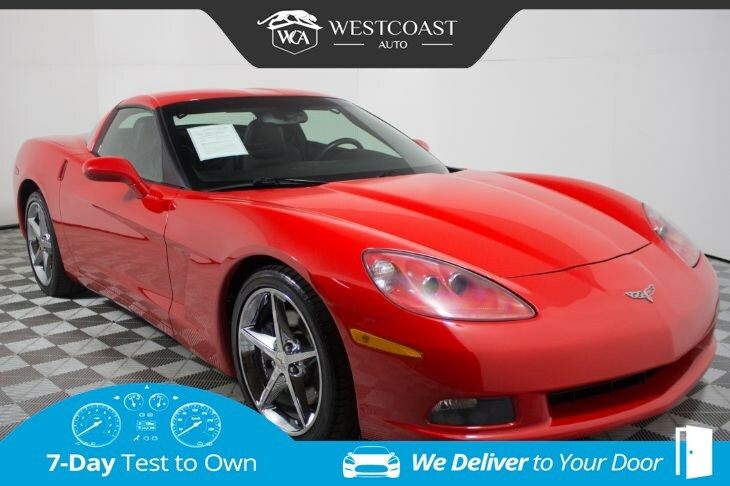 Corvette is the top-selling high-performance American sports car in its class and this one is waiting for you! Print this page and call us Now... We Know You Will Enjoy Your Test Drive Towards Ownership! Great quality, easy financing and affordable prices aren't the only things that make Westcoast Auto Sales the first choice of many discerning auto buyers. Stop in and See California's Dealer of the Year!